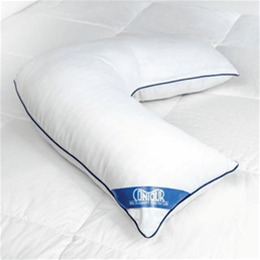 The L-Pillow's unique shape perfectly maintains the optimum side sleeping position. Wrap your arms around one side of the pillow while resting your head comfortably on the other to keep you neck, shoulders and upper body naturally aligned. Super soft, striped damask cover. Package Dimensions 50" x 13" x 6"